I have wanted to change the paint color in our living room and dining room for some time now. We purchased the paint about a year ago and it's been sitting in our garage waiting for us to use it. Well, it turns out when I looked at the label on the can, it's been a year and a half! Sometimes, I just don't understand where time goes. Two weekends ago, we had absolutely NO plans. So we busted open the year and a half old cans and got to work (after lots of stirring). The old color has been on the walls almost 8 years now and I was sick of it (I never really loved it to begin with). 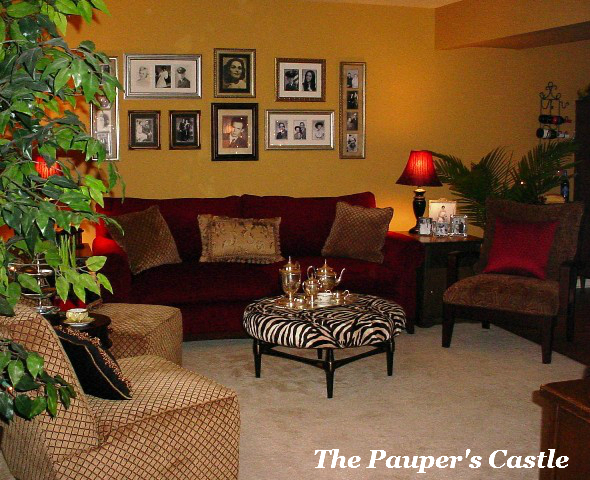 I was so excited to finally lighten up these two rooms. I had chosen a color called Limestone Green. In the can, it's a greenish gray color. On the wall...well...it didn't quite look the same as it did in the can. I kept telling myself, to just get the whole room done and then maybe it will look like it should. Not quite. In some light it looks green, and other light it looks blue. Most of the time, it looks blue (as much as I hate to admit this to Mr. T). This was NOT what I had envisioned. I wasn't about to pick a new color and repaint them. Sometimes, you just have to roll with it and move to plan B! Plan B meant, it was time to go shopping because what I had, wasn't working anymore. Since the paint wavers between green and blue (mostly blue), I decided to introduce some teal! Teal and red (red is the color of my couch, too expensive to replace that) work right? It was like the Decorating Gods were telling me I needed a REAL change (not just a new paint color). I don't think I have ever made decisions so quickly when redoing a room. I walked into Target, purchased two throw pillows in teal. Made my way to Hobby Lobby, and found a fabric I fell in love with. Then made a couple of trips to a few more stores, finally landing in Pier 1 and purchased two (the last two and on clearance, OH Yeah) lumbar pillows. Game on! I had a new vision and new inspiration! I will share the details over several posts in the next couple of weeks. Back to the past two weekends. Todd and I tried our hands at "real crown" molding several years ago. It was not a successful adventure. So we are putting up the Beadle "modified version". Step one is up and ready for step two. Then I decided I wanted a focal wall in the dining room. Something to draw the teal color in. I love the look of wall paper, but don't like the commitment level (pain in the rear to take down). So I decided I would use a wall stencil. I used CeCe Caldwell's Destin Gulf Green over the Do It Best low VOC paint. The base color was a satin finish paint...Limestone Green. The stencil was one from Hobby Lobby. I think it was $16.99 and then I used a 40% off coupon. Instant wallpaper (after 4 hours of work). I am absolutely in L-O-V-E with how this turned out. Although, I never intended for the room to have pops of teal, I'm really glad it turned out the way it did. It's new and refreshing. Even the same old pictures look refreshed. I thought about putting my framed vintage hankies away and finding something new. But I love them against this color. I actually "see" my great grandma's farm picture on the wall now, instead of it blending in! Now, I have a chair and an ottoman to recover, pillows to sew, a chair, end table, a wine cabinet, shelf and curio cabinet to paint. Phew! 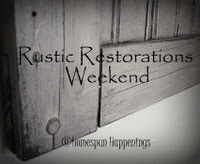 Can't wait to show you our family tree on salvaged shutters! Fall Sugar Maple Leaves; that's what this color reminds me of. It reminds me of the two trees that were in our front yard when we first moved to our home almost 9 years ago. One of the main things that made me fall in love with the house. 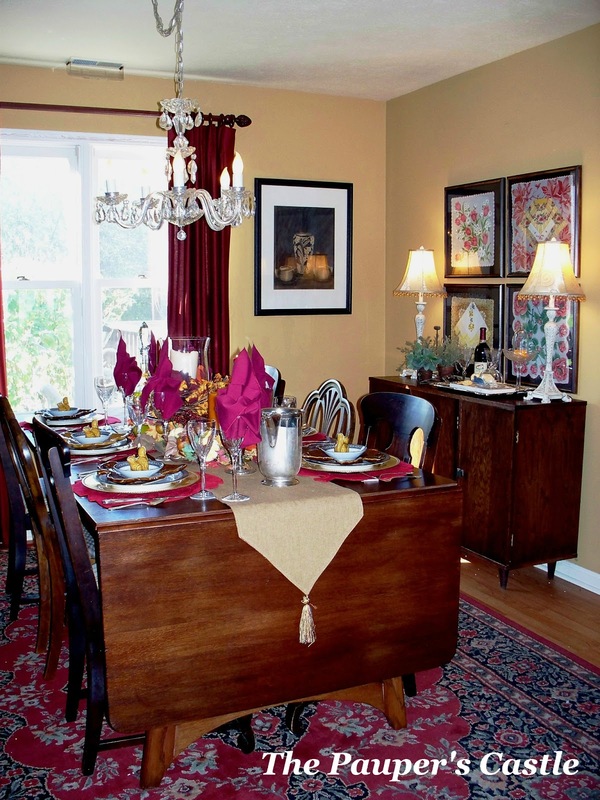 When the sun would come up on a fall morning our two front bedrooms would glow orange. Since then we have lost both of those trees to a fungus. Even more sad, apparently, we never took a picture of the house in the fall or at least I can't find one. I suppose you are asking why we just don't plant another one? Well, the fungus was a soil fungus (verticillium wilt) and you can only replant a tree that is resistant to this fungus. So the trees live in my memory and on this dresser! 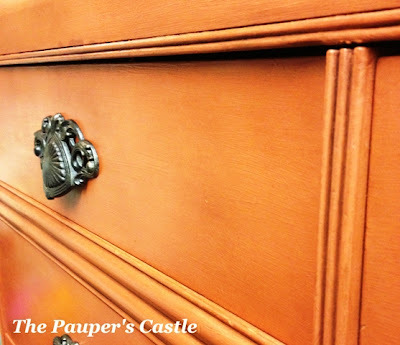 In it's day, this dresser was beautiful. The wood grain on this piece was unbelievable. But like most piece I acquire, it need a face lift! This color was a custom mix of CeCe Caldwell's Kissimmee Orange (2 cups) and Sedona Red (one cup). I wish I had a spot in my home for it! But I don't. So I hope it's new owner will love the color as much as I do! 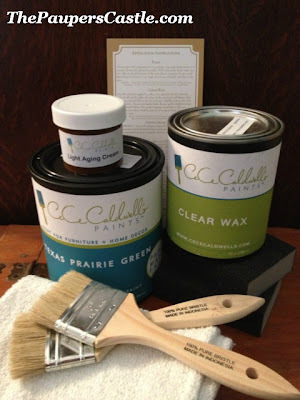 I also wanted to share with you, we are giving away CeCe Caldwell's Chalk and Clay Paint Gift Basket! You will receive 1 Quart of CeCe Caldwell's Chalk & Clay Paint in the color of your choice, 1 Pint of Clear Wax, 1 Sample of Light Aging Cream, 2 - 2" All Natural Chip Brushes, 1 medium grit sanding block, 1 fine grit sanding block and a buffing rag! To find out how to win, click HERE! I am a Preeclampsia Survivor! I am also the Co-coordinator here in Indianapolis for the Indianapolis Promise Walk for Preeclampsia. It is my personal mission in life to share as much as I can, with as many people as I can about the devastating effects of Preeclampsia. I haven't been very present here as of late. My "real" job kept me very busy the end of November and all of December. Then you throw the "sick bug" (really he stayed for 8 weeks) that would NOT GO away. Along with the holidays and it didn't leave much productive energy for anything else. However, it's a New Year (by the way, Happy "Belated" New Year, I didn't even get that posted) and the "sick bug" has decided he is bored with my family and moved on. Slowly I am starting to feel like myself again and projects are starting to fly! I finally was able to get to a dresser that had been in my garage for almost 3 months. If you follow me on Facebook or Twitter, you probably have already seen the end result, but I will do a full post on the before and after later this week. I am in love with this color. It's a custom mix! It reminds me of sugar maple leaves in the fall; the perfect burnt orange. This past Saturday, I held my very first CeCe Calwell's - Rehab Your Rubbish - Paint Made Easy 101 Workshop! I was so blessed to have the most amazing women participate in this class. I absolutely adored each and every one of them. Thank you for making my first workshop such a successful and memorable one! I thought I would share a few photos of the day! This is our new studio space. Still LOTS to be done, but it's a great start! This is only half the group, but they are working hard! Need to get a display case to the left. One for storage and two to cover the booth that butts up next to us! Lisa speeding up the drying process. Lisa and Dianne drying away! This didn't last long. Shortly after this picture was taken, we blew a fuse and didn't get it fixed before the class was over. Too many dryers going at once. Oops! Linda burnished this until it shined! Literally...I have never seen our wax so shiny. This group was an amazing group of ladies. It was fun to see all the different color combinations and the individual techniques that came out. It was a wonderful Saturday afternoon. Thank you for sharing it with me! So I will leave you with this! I thought I would keep it short and simple today. I am getting a lot of questions as of late on proper application of our Clear Wax, Aging Cream and Satin Finish. So I thought I would share our application instructions here and then post in our Tips & Tricks Section so you can reference this easily at a later date. I hope you find this helpful! Have a great week and Happy Painting!